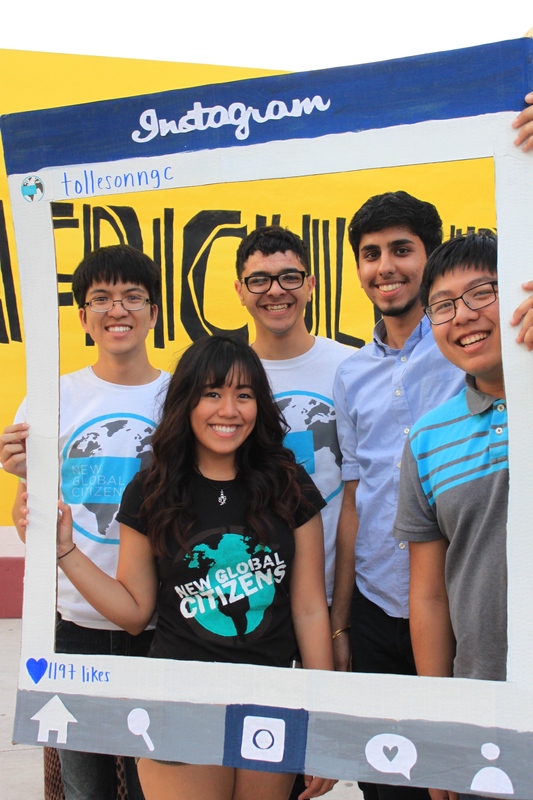 The New Global Citizens team at Tolleson Union High School is continuing to actively advocate for the Global Women’s Water Initiative (GWWI). Team leaders Aneyssa, Malak, and Ronae, have worked hard to educate their campus and community about their project. They have held many successful fundraising and educational events, including an Awareness Week, a Documentary Night, and a Poetry Night. For the remainder of the school year, the team has come up with a new, creative idea to continue to educate their peers: an Instagram campaign! Tolleson NGC is taking advantage of social media to educate more people about their sponsored project, the Global Women’s Water Initiative. The campaign, currently underway, encourages students to learn about GWWI through sharing pictures on Instagram. In the campaign, titled with the hashtag “#wateryoudoing,” participants are to take a picture with the NGC Instagram frame provided at the team’s lunchtime table, or with something New Global Citizens related. Then, participants are to post that picture on Instagram, captioned with a fact about the Tolleson team’s project, GWWI. Only photos tagging the Tolleson NGC Instagram (@tollesonngc) and including the hashtag #wateryoudoing are eligible for the contest. The participants must also challenge a friends to make a post for the contest, and the top 3 posts, determined by the number of likes, will win! The winners will be announces on Tuesday, March 31st, and will be awarded with awesome prizes. This campaign is effective because it does two key things. First, it allows the team to extend their advocacy beyond their surrounding community, giving the potential to educate many more people through the power and reach of social media. Second, it not only encourages students to learn about GWWI, but it encourages them to take it upon themselves to spread information to their peers, giving every participant the agency to be a part of educating a community. This post was written by NGC Team Mentor Kirstyn Rowen. This entry was posted in Uncategorized and tagged afterschool, awareness, community education, GWWI, Kirstyn Rowen, tolleson union high school, water by newglobalcitizens. Bookmark the permalink.